A growing trend within feminist animal studies is to eschew the abolitionism/welfarism binary in favor of attending carefully to the politics of existing interspecies relationships in context. This literature maintains that domestication produces special interspecies relationships which generate ongoing responsibilities for human companions and communities. 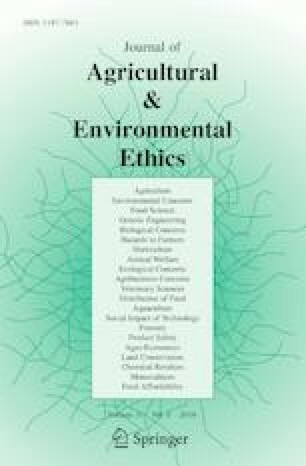 With the goal of clarifying how tending to these ongoing responsibilities to domesticated animals can qualify as enduring forms of interspecies justice, this paper unpacks the politics of these special relationships and obligations in context, specifically, that of fancy rat breeders’ attempts to eliminate aganglionic megacolon. Contrasting fanciers’ efforts with those of laboratory breeders and researchers, I argue that what sets the fancy apart is its shared code of ethics and the loving, principled form of life from which it emerges. Furthermore, the knowledge that rats are worth loving not only enables fanciers to attend to the injustice of megacolon but facilitates transformative justice for domestic rats more broadly. I am very grateful to Paul Thompson, Kyle Whyte, and Zachary Piso for their help and support throughout the development of this project. I would also like to thank the Geocognition Research Laboratory at Michigan State University and Lynn Keller for their invaluable insights. AAALAC International. (2015). Accreditation. AAALAC.org. http://www.aaalac.org/accreditation/index.cfm. Accessed June 3, 2018. American Fancy Rat and Mouse Association (AFRMA). (2014). AFRMA breeding rats & mice: Care and guidelines. AFRMA.org. http://www.afrma.org/sales/contentsbreed.htm. Accessed April 10, 2018. Association of Colorado Rat Enthusiasts. (2006). ACRE code of ethics. http://coloradoratenthusiasts.org/code-of-ethics. Accessed May 4, 2018. Booth, C. (2002). Megacecum and megacolon: Development disorders in the enteric nervous system in rats. AFRMA Rat and Mouse Tales. http://www.afrma.org/megacecum.htm. Accessed June 9, 2018. Confessions of a Rat Breeder. (2013). “High white markings” what does it really mean? http://bwr-rats.blogspot.com/2013/09/high-white-markings-what-does-it-really.html. Accessed November 12, 2014. Curiosity Rats. (2013a). Breeding information. Curiosity Rats. http://www.curiousv.com/curiosityrats/files/infobreed.html. Accessed May 2, 2018. Curiosity Rats. (2013b). Genetics: White markings. Curiosity Rats. http://www.curiousv.com/curiosityrats/files/geneticsmarkings.html. Accessed May 2, 2018. Hilscher-Conklin, C. (1996). Rattus biologicus: The domestication of the rat. Rat & Mouse Gazette July/August. http://www.rmca.org/Articles/domestication.htm. Accessed April 18, 2018. Isaksen, M. (1999). The rat fan club breeding: Can YOU live with it? http://www.ratfanclub.org/breeding.html. Accessed June 2, 2018. Ontario Rattery Club. (n.d.). Code of ethics. OntarioRatterClub.com. http://www.ontarioratteryclub.com/code-of-ethics.html. Accessed December 4, 2014). Rat Health Guide. (2013). Megacolon. RatHealthGuide.com. http://ratguide.com/health/digestive/megacolon.php. Accessed May 22, 2018. Royer, N. (2000). Breeding—beyond the basics: Ethics. American Fancy Rat and Mouse Association. http://www.afrma.org/breeding-ethics.htm. Accessed June 6, 2018. Royer, N. (2015a). The history of fancy rats. American Fancy Rat and Mouse Association. http://www.afrma.org/historyrat.htm. Accessed June 6, 2018. Royer, N. (2015b). A responsible breeder’s code of ethics. American Fancy Rat and Mouse Association. http://www.afrma.org/breedethics.htm. Accessed June 6, 2018. The Advocacy of Veganism Society. (2018). Mission. http://www.abolitionistvegansociety.org/about/mission/#.Wyfw1KdKjIU. Accessed May 18, 2018. The Great Lakes Fancy Rat Association. (n.d.). GLFRA code of ethics. GLFRA.com. http://www.glfra.com/GLFRACodeofEthics.pdf. Accessed November 12, 2014. Topi Rats. (2014). My breeding code of ethics. TopiRats.com. http://www.topirats.com/codeofethics.htm. Accessed April 20, 2018.